Anybody opened one of these up? Picked up a parts truck, low miles but sucked water and may have thrown a rod. Going to pull it and tear down. If it's not bad an shows no cracks, might freshen it up and run it. I see the SOHC heads don't use replaceable cam bearings and the main cap is a one piece plate. Any advice or input? It's in an 08 Dakota. Its almost like they make these motors and transmissions these days to be disposable instead of rebuildable. I bought a Jeep Patriot 4-banger for my youngest daughter, and wanted to service the transmission because it haves 100k miles, and my mechanic showed me a Chrysler service bulletin saying that isn't recommended. Just by way of an update, I ran a compression test and had lots of variation between cylinders and a 0 in #7. Either a rod in the pan or valve seat gone is my guess. Spec is 175 psi minimum, 15% variation but I find most stuff you figure out where the block heater is real fast. The plastic intake is easy once you deal with the wiring harness and fuel rail. The EGR has to come off or you do a lot of messing around to pull it off. got everything unplugged and marked, the Dakota has a couple supports from the front axle tied to the block/motor mounts so that is this weekend's problem. At least there are two nice bolt hole in the valley for pulling the motor with. There are a few versions of this engine with different camshaft wheels in the passenger cylinder head. You have to match the tooth count to the ECM you have. So keep the old one around. 2008 up cylinder heads have dual plugs and are identical across applications but the older single plug jobs vary in tone wheel, ECM, and cylinder head casting (check the location of the EGR on the right cylinder head). 08 up cranks are harder, and the rods are no interchangeable. 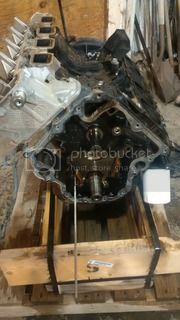 Pulled the engine this weekend, top end looked good but the windage tray was trashed and the #7 rod was snapped in half. Likely a lot more damage to block, crank, etc. Found a junkyard core that runs for cheap and has a nasty valve tick or timing chain issue for a rebuildable core. Going to open it up and freshen it up then see what I have for heads that aren't warped too badly. There is a special tool for pulling the rocker arms in these, money well spent. The most common problems seem to be the hydraulic lash adjusters and timing chain tensioner - not an engine that takes well to dirty oil. Connecting rod bolts are the only true torque to yield bolts in these, rest can be reused if not stretched. The aluminum bits are picky about torque sequence both on and coming off. will see about pics later. the old engine out. There are no 'lifters' just 'lash adjusters' . Difference being if they collapse the rocker arm can fall off. The damage done. The pan gasket is integral to the windage tray. Proper removal technique is a mallet to the side of the pan. Pry and you ruin it. Last edited by Darlantan; 10-29-2016, 12:27 PM. Follow up, some more pictures. Got time on my hands, came up with a low miles junkyard core. Ran but had what sounded like valve train noise. OK this is the rocker removal tool for these SOHC engines. Beg or borrow one, beats pry bars and screw drivers on the hollow mild steel camshaft. The lobes are pressed onto it. 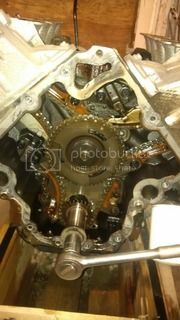 got the timing cover off, behold two of the three chain tensioners pretty much limited out. you literally pinch the primary chain tensioner and pin it open. Special pin tool = 3/32 welding rod. 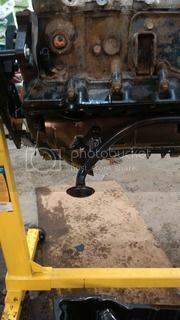 that's the oil pump under the guide bracket. Crank drives straight through it. Neat. That's all for now, drop the pan tomorrow then off to the machine shop. Cross hatch is clear and no ridges at 100K miles, see what it mics out to. Last edited by Darlantan; 10-31-2016, 09:52 AM. When these engines showed up on the scene, I thought that maybe we'd have a new high tech base to build from but nothing ever came of it. Seems to be maybe it was just a test run for the new Hemi engine? They seem to be pretty good but man, got to pull a head to replace a lifter doesn't bode all the well in my book. They aren't bad to work on. I could have done the lifters ('lash adjusters') in the truck but I am doing a rebuild for something to do but the . Since Ford killed the Ranger, Dodge's promised new midsize isn't forthcoming, and the Chevy, Toyota small trucks are nothing to write home about, I am picking away at this for giggles while I drive my current '05 Dakota. The biggest failing in them from a rebuilder's perspective is the lack of cam bearings. Just hardened caps, so the guys doing cam swaps on the pre '08 engines were taking their chances. If you have cam issues, you're looking at a new head assembly at a little over $1K. There were some differences in castings on the pre-08's with the 'H/O' being the most desirable. There are actually some pretty interesting builds on these engines (including blowers). Air Ram Performance has lots for the pre - 08's including tuners, flash programming, etc. Probably not enough post -08's in the scrapyard yet. So update, the pistons in my good core were scuffed. 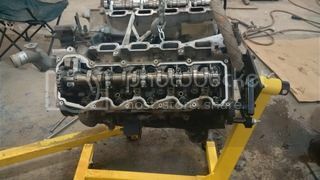 No point dropping new slugs in worn holes, and the bore and pistons puts the cost of parts and machining within a couple hundred bucks of a reman long block. 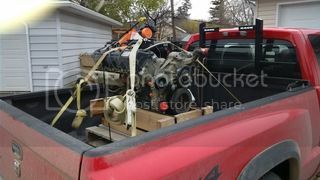 New pistons for the 2008 up 'Corsair' 300 horse version are scarce - only two suppliers (Mopar only offers a long block), so I am weighing options. Difference will likely be the reman needs a journeyman installation for warranty, local machinist might do better. I am doing this for fun, economics don't get into it too much so I will update this with decision, install as I get there. Machining and parts came in under after I got the right piston part number and excluding head bolts but including con rod bolts. Even found lash adjusters for $11 each, way better than I thought I would get. With two blocks' worth of head bolts should be able to find enough not stretched ones. The FSM says reusable if the threads pass a straight edge check. Assembly in a couple weeks once I have bits and machined stuff. Parts are ready at the machinist, picking them up tomorrow. Looking through the assembly procedure, looks like it needs thread sealant, blue loc-tite, and some kind of anaerobic sealant for the bed plate. Anybody got ideas on what to use for the bedplate, exhaust bolts, etc on one of these? I don't know that engine, but use studs instead of bolts on any aluminum. If heads are aluminum use header studs and valve cover studs - and never use Blue Loctite into aluminum threads as you could pull them out, use Red. Buy a Craftsman rethead/thread Repair kit and use it to chase any bolts you're reusing. What's the rationale behind the studs? FSM specifies re use of the old bolts for the heads if they pass a straight edge test? book says thread sealant not locker on exhaust. So got the redone heads from the machine shop, block went to 0.5 mm or 0.0020 over in the bores and the crank got standard bearings with just a polish. 22 bolts for the main girdle, the rear seal is a one piece drive on. 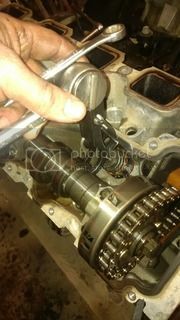 Key was to re torque the bolts to prior spec to get each step right. Permatex anaerobic flange sealant goes on the outside edges. Main bolts aren't true TTY, but one had a little more give on the last twist so I borrowed from my junk block. connecting rod bolts are TTY so fresh ones went in. The DNJ brand pistons were indifferent as to direction and the connecting rods are chamfered both sides unlike earlier units. On the last cylinder, bent one of the paper thin oil ring scrapersand scratched the cylinder going in. 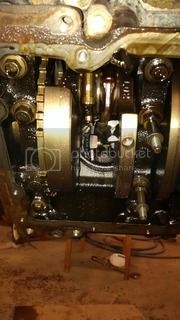 320 Emory cloth took it out but that finished me until I get another oil ring to close it up and start on the timing set. priming the oil pump on these is slick with a pipe plug on the passages either side of the oil filter. This Photo was uploaded by darksilver7. Last edited by Darlantan; 02-24-2017, 08:55 AM.